The inelegantly named 'Weymouth Nose-Poker' railtour passes Oddington on 24 October 1987, worked by Tyseley set T405 (51143, 59615, 59726 & 51854) & Class 121 55032, which had recently been transferred from the Western Region. 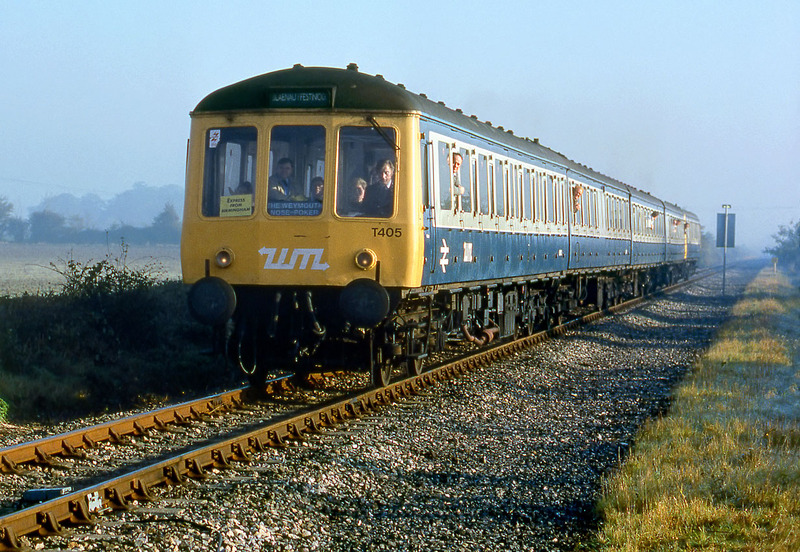 This tour was organised by the Severn Valley Railway Association, and had originally been planned to travel along the Weymouth Harbour Tramway, but BR had insisted that the tour terminate at the town's station due to possible obstructions on the branch. In a move that certainly wouldn't happen today, the driver persuaded the signalman to let them cautiously negotiate the branch. The highlight of this was the unit literally passing within an inch of a boat propped up on the quayside! Apologies for the poor quality of this image, but for some reason I pressed the shutter much too soon (no motor drive in those days). Luckily this is from a Kodachrome 25 transparency, or at least a tiny part of one!